President Jacob Zuma’s visit to Zimbabwe could be leveraged to address pressing trade and investment issues. By Liesl Louw-Vaudran for ISS TODAY. It is never really a good time for a high-profile state visit to Zimbabwe. The economic and political crisis that started in the early 2000s has made official trips to that country a rarity, often mired in controversy. This week’s state visit by South African President Jacob Zuma is likely to be no different. 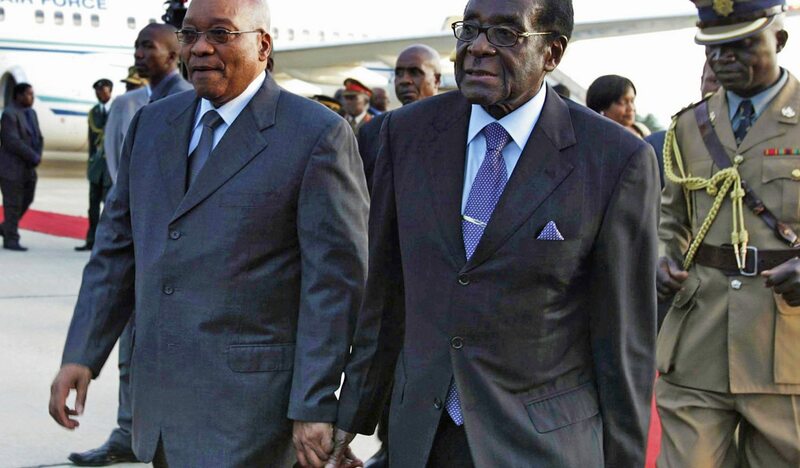 Zuma will visit the country this week to reciprocate Zimbabwe’s President Robert Mugabe’s trip to South Africa in April 2015 – the first such state visit from Mugabe in more than 20 years. Zuma’s visit comes at a troubled time for the president and for the African National Congress government, which is facing strong criticism linked to state capture, corruption scandals and South Africa’s surprise withdrawal from the International Criminal Court. Having his picture on the cover of South African newspapers, greeting Mugabe on home soil in Harare, won’t do much to improve Zuma’s stature in some circles. However, South Africans with longer-term interests in economic growth and stability in the region are looking beyond relations between these two leaders. Hyperinflation in Zimbabwe reached a peak in 2007 and 2008, forcing economic migrants to leave the country. To prevent this recurring, cool heads and positive engagement are required from the regional heavyweight, South Africa. The Southern African Development Community (SADC), which mediated in the political crisis in Zimbabwe up until the 2013 elections, currently has enough on its plate and doesn’t really have the capacity to deal with any large-scale conflict in the region. Clearly, it is no longer possible to turn a blind eye to the renewed crisis in Zimbabwe. The challenge would be to go beyond the justified outrage against misrule by Mugabe – and lately also Zuma. Last week, Zimbabwe’s reserve bank governor John Mangudya announced that despite many warnings from international financial institutions, the Zimbabwean government is going ahead with printing bond notes to help solve the liquidity crisis in the economy. These notes have been widely rejected by the population. Prospects for a major cash bailout by the International Monetary Fund, in exchange for reforms such as drastically reducing the number of civil servants, seem increasingly unlikely. In addition, the battle over who will succeed the 92-year-old Mugabe is likely to intensify in the run-up to the Zanu-PF party’s annual national conference in December. According to Catherine Grant Makokera, director of the Tutwa consultancy and an expert on trade and investment in southern Africa, the monetary situation in Zimbabwe (caused largely by its use of the US dollar), has had a disastrous impact on the economy. “Even large companies say they’ve been forced to resort to a form of barter trade,” she says. In recent months, speculation has been rife that Zimbabwe might adopt the rand to help solve the currency crisis. If that happens, it could give South African companies and even government a measure of leverage to impact on the domestic situation. However, Zimbabweans generally mistrust the rand because of its fluctuation to the US dollar, and Mugabe is evidently too proud to accept his neighbour’s currency. In addition to the currency problems, the ban on imported goods that was slapped on traders in July 2016 has still not been lifted, even though smaller cross-border traders are managing to find ways around it. The protection of investments and the implementation of the indigenisation act by the government are other major concerns for South Africans, says Grant Makokera. At the time of Mugabe’s visit to South Africa last year, a bi-national commission was set up to elevate the relationship between the two countries to heads-of-state level. South Africa and China are Zimbabwe’s largest trading partners, with big trade imbalances. Last year, Zuma said that exports from South Africa to Zimbabwe reached R24.8-billion in 2014, while imports from Zimbabwe fell to R2-billion, down 55% from the R4.4-billion in 2005. Ironically, if the political crisis can be resolved, business leaders believe that there can be a fairly quick turn-around of the situation. Retailers already present in the country can expand in a relatively short time. Potential investment that has been dormant for 20 years, given the high risk of investing in Zimbabwe, could be released. There are also ample investment opportunities in the mining industry. Ultimately though, it is still the political situation that is keeping foreign investment out of Zimbabwe – and the economy in intensive care. At a recent briefing held at the Institute for Security Studies in Pretoria, consultant Piers Pigou warned that there has been a spike in repressive action against any opposition to Mugabe and the ruling Zanu-PF. High-profile arrests like that of #ThisFlag movement leader, pastor Evan Mawarire, and the disappearance of activist Itai Dzamara, are only the tip of the iceberg. Pigou said a starting point could be constructive engagement from the international community about the reform agenda of some members of the government – which includes Finance Minister Patrick Chinamasa and Vice-President Emmerson Mnangagwa. The SADC, however, has avoided putting Zimbabwe on the agenda. “It is only now, due to the economic fallout and the restrictions on imports, that South Africa is waking up to the situation,” said Pigou. Pigou told ISS Today last week that Zuma is likely to tread carefully during his visit to Harare. “Mugabe is not someone who can easily be leveraged,” he said. The visit is also likely to be manipulated by some of the role players in Zimbabwe’s succession battle for their own factional agendas. However, the timing of the visit could be useful for South Africa to “support a constructive and inclusive way forward”. South Africa’s engagement needs to be more pro-active, in line with its stated commitment to solving conflicts on the continent. “A hands-off approach has done little to avert the continued slide downwards,” he said. The ideal would be to start looking towards the 2018 elections and to make sure they comply with the SADC election guidelines. An umbrella structure of opposition parties has come together to demand electoral reforms. Civil society organisations are also using the SADC guidelines as a lobbying tool. Other outside actors, such as the European Union, should be more robust in their engagement with Zimbabwe. If not, they will be seen to be merely propping up Zanu-PF and perpetuating a deteriorating situation through its financial support, he said. Martin Rupiya, associate professor with the Institute for Renaissance Studies at Unisa, agrees that while there was a clear strategy led by the administration of former president Thabo Mbeki, “that of President Jacob Zuma appears to have placed the Zimbabwe issue on the back burner”. The erstwhile high-profile South African negotiating team to Zimbabwe, led by Small Enterprises Minister Lindiwe Zulu, seemed to have “disappeared”, he said. At this stage though, everyone seems to be adopting a wait-and-see attitude while Mugabe continues to hold the reins, after 36 years in power.